Surprise! Things with the Gomers have changed already. 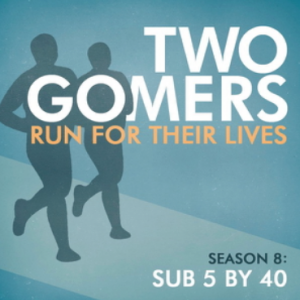 Listen to this, the final episode of Season 2.5, for the details of what exactly Season 3: Two Gomers Strike Back (working title) will entail. Atlanta won't know what hit it. Also, plenty of fall TV impressions, folklore remembrances, babysitter pricing discussions, and yes, running talk! Everything you’ve come to expect in an episode of the Gomers. And all the regulars – Week in Review, Gomers Tips, Listener Feedback, and two (or more) new Songs to Run To. See you in November, Happy Running! Let us know which you like best! Previous PostSeason 2: Episode B – True or FauxNext PostSeason 3 : Lil’ Season 3 Teaser! Great podcast, as always… but YIKES! on the new sub-goal. Should be a fun season to listen to. I am a longtime fan and have commented before. Two weeks ago I ran a half marathon 21 minutes faster than I ran a half marathon in May. It was five months to the day. I ran 5 times a week and included strength training and yoga. IT CAN BE DONE. YOU WILL BE FAST!!! GODSPEED! Hi guys. Loved the episode! I suggested the Sub-5 Strive title, so I’m loving the voting. Thanks for all the inspiration and laughs! Can’t wait for season 3! I like the “Sub Five Strive” it has some fun alliteration to it. A Half Marathon in under 2 hours? You guys realize that’s 9:09 per mile, right? 🙂 Rootin’ for ya! I think the 2 hour mark is doable. I’m sure you can do it! I like the sub five strive! Thanks for such a great podcast. I can’t wait to get back to running!